When Should You Have The Radiator Replaced? What Is Done During A Radiator Replacement? Replacing the radiator in your car is usually only necessary when the radiator is beyond repair. While some parts of the engine are better replaced than repaired, the radiator can usually be patched up by a skilled mechanic, thanks to the simple internal mechanisms. If it is beyond repair, standard radiator replacement cost ranges between $292 and $1193 for both the parts and labor involved in the installation. The average cost for radiator replacement will be near $671. The cost will vary significantly depending on your model of car and the complexity of the work involved. Some car manufacturers are far more expensive for the part than others, with the cost of a new radiator varying from $182 up to $921. There are some sample costs for common car models at the end of the article to help you get a better idea of what you can expect to pay. Below are the typical costs of a radiator replacement from some of the major national auto repair chains in the country. The costs highlighted here include both the parts and the fitting of the radiator, and should be taken as a rough guide only. To get a fully accurate quote you should contact your local garage for an estimate on the cost of the work. The radiator in your car is essential for preventing the engine from overheating. As the engine runs it produces heat, and coolant is run through it to help remove this excess heat. The coolant is then passed through the radiator, which cools it off and circulates it back through the engine to remove heat again. Inside the radiator are two tanks, connected through tubes which are typically made from brass or aluminium. As the coolant passes through these tubes, the fan inside the radiator blows air across it to lower the temperature. These tanks are usually made from plastic, and one of the most common faults in the radiator is for these tanks to crack and leak coolant. If this happens there’s a real risk that the engine will overheat, causing serious long-term damage to the engine. Another common fault is for the radiator to become clogged, preventing enough coolant from passing through the engine. Again, this risks the engine overheating and becoming seriously damaged so regular maintenance is essential. If there’s substantial damage to these internal workings, the radiator may need to be replaced. Your mechanic will advise if a repair or a full replacement is the best option for your car. Having a well-functioning radiator in your car has a number of positive benefits, alongside avoiding the permanent engine damage we mentioned earlier. Replacing a broken radiator will help ensure the long term health of the rest of your engine, it will lubricate and protect the water pump, help ensure the car has optimal power and performance and will help your engine perform better all-round. A working radiator will protect the heater core (allowing you to have heat inside the car), and can help prevent it freezing up in winter or overheating in the summer. It will help reduce engine corrosion, which can cause expensive damage to the rest of the engine, and it can reduce the odds of you blowing a head gasket in the engine block. Regular maintenance should keep the radiator in good working order, and the occasional radiator flush will help remove any build up in the pipes. You know that the car radiator replacement cost is much more than the occasional check up so make sure you are taking good care of your radiator and coolant levels. Each car will have an optimal maintenance schedule which will be provided by the manufacturer, and this will include having the coolant replaced regularly during a tune up. Typically this will be between 25-40,000 miles, and replacing the coolant should help prevent any issues with delivering the coolant to the engine. If there’s an issue with the engine overheating then there’s a good chance the radiator tanks will crack, potentially causing major damage if they’re not repaired or replaced quickly. Your garage will either repair the tanks and thermostat, flush the old coolant and replace any faulty hoses, or recommend replacing the radiator entirely. A radiator hose replacement will only cost $50 on average which is much less than the complete maintenance fee. 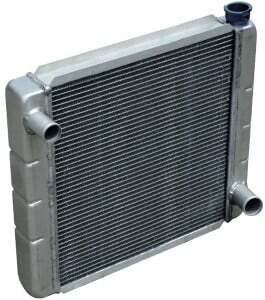 Common signs of the radiator needing replacement are regular overheating of the engine or seeing coolant leaking from the engine. You’ll normally notice the coolant leak if your car has been stationary for a period of time, and there will be a small pool of red or yellow fluid under the car. If you notice this, take the car to a garage immediately to prevent serious damage. Radiator replacement can be an expensive repair, costing over $1000 in some cases for parts and labor, so finding a good deal is hugely important. If you’re confident in your DIY skills then replacing the radiator yourself is one way of saving some money, but it can be a tricky repair and you may need a garage to drain the coolant for you. If you’re taking it to a mechanic, the usual rules of saving money on auto repair apply. Make sure to get the work done somewhere with a good reputation, but look around and get a few quotes before you get the work done. Find out if it would be cheaper to have the radiator repaired rather than fully replaced. Unlike some engine parts, the radiator is straightforward and easy to repair so it may be more affordable to repair it instead of a full replacement. Minor radiator repairs, such as a leaking hose, can be done yourself fairly easily. The challenging part is diagnosing the fault, but these parts can be purchased online and fitted fairly easily. Below are some sample costs for radiator replacement costs for some of the most popular cars in the country if you were wondering how much does it cost to replace a radiator. The price will vary from garage to garage and from state to state, but it should give you an idea of how much you can expect to pay to have the radiator in your car replaced by a professional.